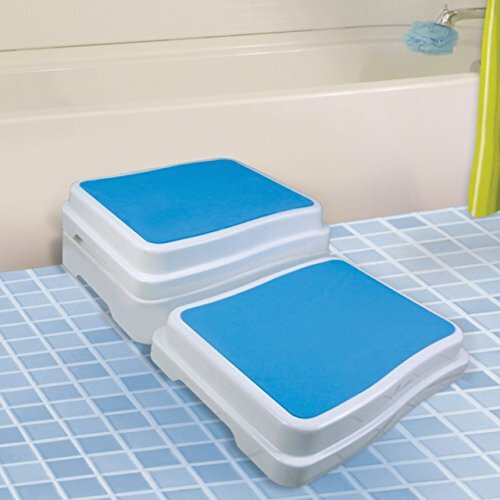 Bath Step by Reizen at Walk In Tub Showers. MPN: 20535. Hurry! Limited time offer. Offer valid only while supplies last. Get into and out of your bathtub more safely and easily! This Bath Step adds almost 4-in. to your step and has an extra-large 19.75 in. x 16 in. Get into and out of your bathtub more safely and easily! This Bath Step adds almost 4-in. to your step and has an extra-large 19.75 in. x 16 in. platform for more secure footing. Includes one step. (Buy additional steps and stack them - each extra step adds 2-in. of height.) FEATURES & SPECIFICATIONS: - Complete textured finished top for slip-resistant safety and comfort - Rubberized feet to help prevent slipping - Modular design for secure stackability - First step adds almost 4-in. ; each additional stackable step (purchase separately) adds 2-in. - Sturdy construction: 90-percent plastic/10-percent foam - Supports up to 418 lbs. Product Weight (approx. ): 4.5 lbs. Item Package Dimensions: 19.89 in. x 16.5 in. x 4.06 in. Supports up to 418 lbs.